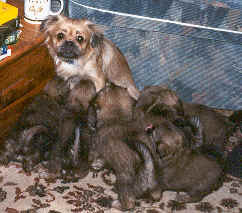 Our breeding philosophy is a simple one, we breed to further the Tibetan Spaniel as a breed. Each of our breedings is carefully planned with hours spent scrutinizing pedigrees and prospective breeding dogs in order to improve on the previous generation. We breed only dogs of proven temperament and conformation with all dogs used in our breeding program certified by veterinarians against heredity disease such as Progressive Retina Atrophy, as far as humanly possible. All of our dogs live with us and the puppies are all home raised. All puppies are extensively socialized with their mother and father, other Tibetan Spaniels, larger breeds such as our Rottweilers and cats. We also ensure that they have a great deal of human socialization. No puppy is placed in its' new home until at least ten weeks of age. We believe that we are responsible for the puppy from the time of it's conception to the time of it's trip to the rainbow bridge.